Click here to download a printable PDF of this article. The very first conversion to Judaism takes place in this week’s parshah. The Torah relates that Yitro (Jethro), the father-in-law of Moses, traveled from Midyan to join the Jewish people. The Talmud explains that there were two events that prompted him to convert. 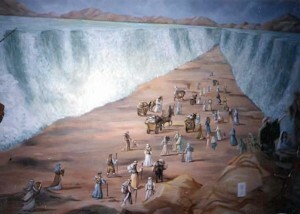 The first catalyst was hearing of the miraculous splitting of the Yam Suf, the Red Sea. The second was hearing about the war with the nation of Amalek that took place at the end of last week’s parshah.